Oh dear sweet Beezus what have I done. I was playing Bioshock a while back and noticed that Fort Frolic's atrium sort of reminded me of Offblast's center for some reason. And it got me to thinking... could it be worked into a decent Arena map? Well, after a couple days of non-stop building, several months of doing nothing, and a couple days of on-and-off tweaking, I think I have something that might work. Mainly at this point I'm looking to see how the layout can best be added on to. I'm not holding out much hope that it could ever be properly detailed since, well, that's essentially a total conversion mod. Note also that I have never played the Fort Frolic multiplayer map in Bioshock 2, which probably could have helped me somewhat. oh god the memories they're coming back. oh man oh god oh man oh god. Those stairs are literally off the grid, by the way. I couldn't figure out a better way to make sure they were the right dimensions. And that's without the proper textures. Speaking of off-grid, you know what happens to Hammer's 3D view when the texture you use for 90% of the floor space in the map has a 45-degree rotation in its material file? Your dev textures decide to jump in and join them. This is going to be such a fun layout to work on. I wonder if this will actually play well in TF2. What detailing will you do for it? Classic Bioshock or a mix of TF2/Bioshock? My vision is for the detailing to be the same as Bioshock, but with the higher poly count that's expected of a Source game and with the same "painted" look used by the stock content. Rockwell and Leyendecker lived and worked during the same period Bioshock takes place in, so it seems like it'd be a good fit. That having been said, I have no experience with 3D modeling or texturing, so this depends largely on whether I can find the time and willpower to learn, or someone else with experience stepping into the picture. Looks super sweet, I love the way Bioshock looks and it's looking great mixed with TF2! Fixed the download file not having an extension. Thanks for that "feature", 7-Zip! Bumping for gameday and to mention that I added some signage and the ammopacks I had forgotten the first time around (or maybe my plan was to leave them all out and let people tell me where they needed them the most... but if it was, in hindsight it was a bad idea). People had a bit of a hard time finding the control point and suggested I either move it or add signage. I can't really think of a better place to put it, so I'm adding some more signs, most prominently one over the door itself. Hopefully people will at least see that when they're running around and figure out where the point is before it unlocks. I noticed an engie camping the downstairs doors with a mini-sentry. Does this seem like a potential issue to anyone? I have no real problem just removing the doors (I'm honestly not sure what they were there for in the original game; I just left them in for authenticity). 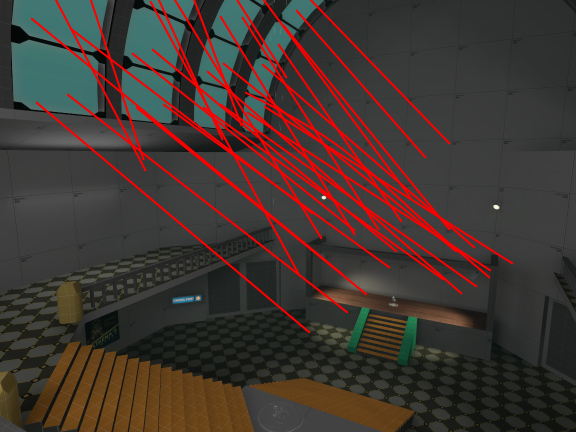 I caught an uncloaked spy trying to hide in the space under the spawn room stairs, so I'm going to just fill them in for now. That whole area is going to be redesigned eventually once I get some theming stuff to play with. Problem is, what I have here still isn't good enough to actually turn into a Source-compatible model, since it's using a flat TGA file for its material instead of a VMT file. And... I'm not sure how to do that. I remember reading that Source's format includes some text files that can be edited; should I just try exporting what I have and then edit the files by hand? Went to fix the cubemaps, ended up creating a brand-new version. Warmer lights, more accurate windows, a more complex dome, and posters courtesy of Umodel! I'm being held up on more changes because placing the original textures on the walls revealed some significant scaling differences that I'm now struggling to reconcile. In the meantime, here's some screenshots. It looks dark. Is it the theme you're going for? 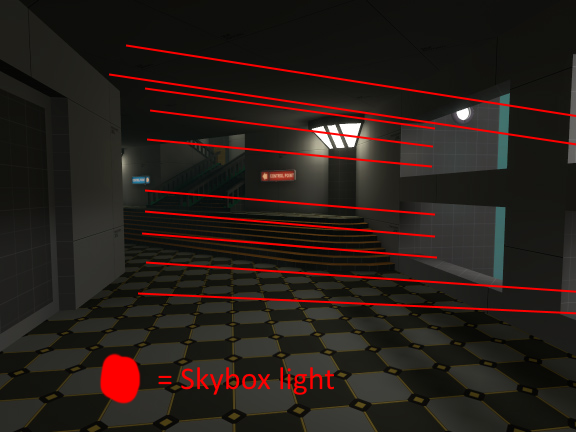 If not, Try adding lights going in like the image below and more windows. >IS FORT FROLIC BEING PICKED UP AGAIN?!?!?! ?